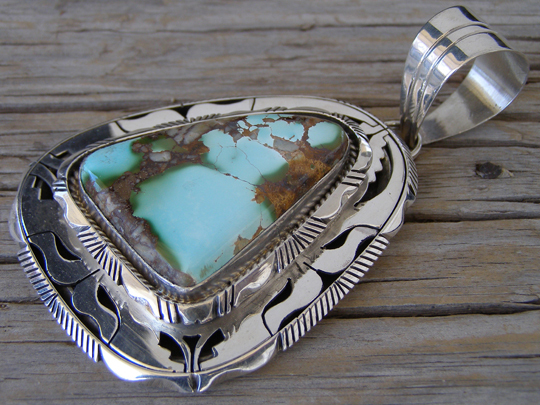 This large pendant is set with a particularly thick triangular stone of natural Royston turquoise from Nevada. The stone is set in a smooth bezel wrapped with twist wire within a raised shadowbox that has a saw and filework border. Cut-out work constitutes the main decorative element of the pendant in concert with fine saw work. The elegance of the silversmithing in combination with the cut, color and size of this Royston stone make this a superior collector's item. Elouise added a large bale to this pendant and it begs to be strung on a strand of large handmade Sterling beads as shown in the fourth photo (beads not included). Stone: 1 5/8" x 1 1/4"
Dimensions of pendant (excluding bale & jump ring): 2 3/4" x 2 1/4"